After a bit of a pause in February, the euro has once again started falling, following the start of sovereign bond purchases by the ECB and yet another strong US non-farm payrolls print. So just how low can it go? I see plenty of analysts calling for 105 or lower by the end of the year, which seems very reachable given were we are today. 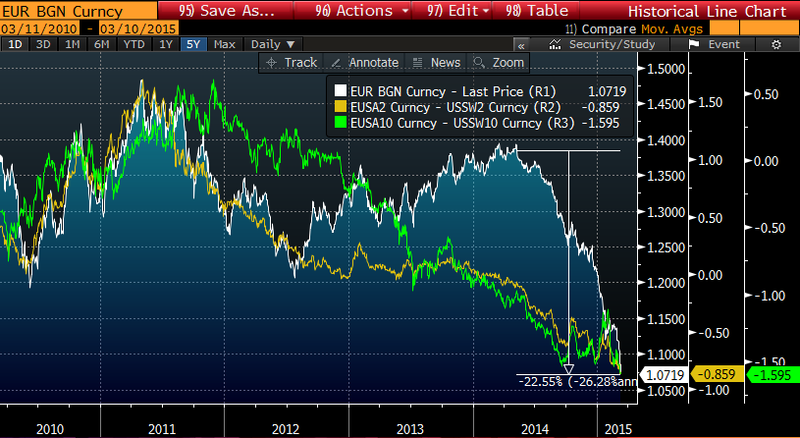 In terms of rate differentials, the current level of the euro actually looks about right. The period that looked particularly odd was late 2013 and much of 2014, when it looked far too strong. But inflows into European equities (and to a lesser extent bonds) were very strong over much of that period, and the ECB was still dithering about serious easing. Flows turned around towards the end of last year and the ECB have finally delivered. But a significant amount of the euro decline is a dollar story. In fact, while EURUSD is down over 20% since early 2014, the euro effective exchange rate (vs a basket of 19 trade-weighted currencies) is down around 13%. 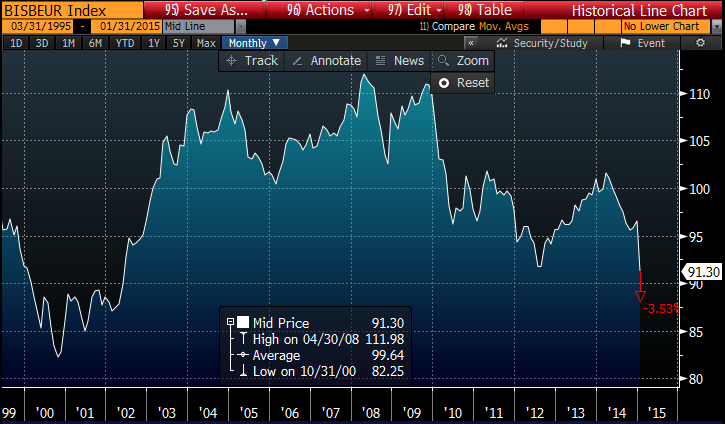 That is still a sizable move for the euro, and in real effective terms is approaching the all-time lows of 2000-01. If European rates can maintain their de-coupling from the US, then rate differentials alone should imply EURUSD close to parity (assuming I am right about the Fed hiking later this year).